Despite my reservations about Spotlight, it really can do some amazing things. Consider digital photographs. With every image you snap, a wealth of data is recorded with the picture. Exactly what information your camera captures depends on its make, but most include basic items such as aperture, focal length, and exposure (shutter speed). When you place photos on your Mac, Spotlight reads and indexes this information, making it possible to run some interesting searches. When you run the search, however, you’ll get quite the surprise: it will find every image that has an exposure time value. Why? Because Spotlight doesn’t like the non-integer value—.33. It converts this number to a zero before running the query. Hence, it finds every photo that has a “greater than zero” exposure time, which will be all of them. This doesn’t just happen with values that are less than one; it happens any time you want to try to find a non-integer value for an image-related field. Spotlight isn’t rounding the entries up to the next whole number, either, it’s just taking the integer portion. So if you were to try searches with values of 2.99, 2.50, and 2.25 for a certain field, Spotlight would simply use 2.0 as the search value. The kMD… bit is the name of the actual field (or metadata ) that holds the exposure time. As you can see in the bottom window, there are only 15 images on my machine with exposure times over a third of a second, not 8,152 as indicated by the results in the topmost window. So that’s how you solve the problem. But how did I find out the crazy term ( kMDItemExposureTimeSeconds ) Spotlight uses instead of “Exposure Time”? That’s good to know, because, of course, you can use Raw Query mode for any search, not just to work around this integer value problem. The easiest way to find out what metadata you can search for is to open Terminal (/Applications -> Utilities) and then change into a directory containing images, such as your user folder -> Pictures or your user folder -> iPhoto Library folder. Now you just need to find a photograph so you can see what metadata it holds. The command ls will show you what’s inside the folder. To see what Spotlight fields you can query on the file, type mdls “somephoto.jpg”, where somephoto.jpg is the name of the photo you’d like to check. You can use any of these you like in a Raw Query to find photographs based on non-integer values. 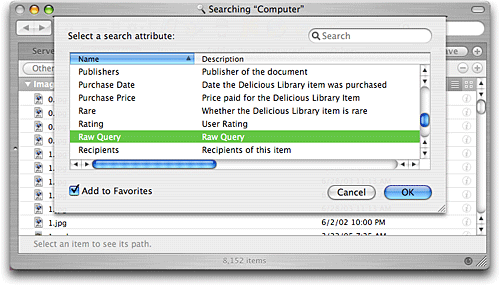 Once you’ve run a search once, remember you can use the Save button to make it easy to recall that query again in the future. If you do this kind of thing a lot, consider setting up three saved queries, one for each field. 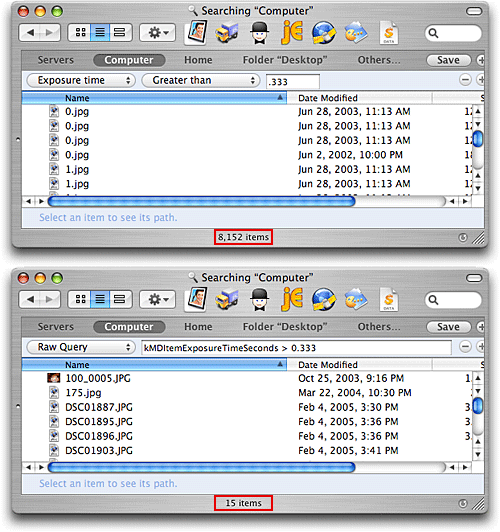 When needed, just opened the saved search, and then edit the comparison and value as necessary for the search you’d like to run. Hopefully a future OS X update will address this problem, as these fields should be fully searchable using the standard Spotlight interface.